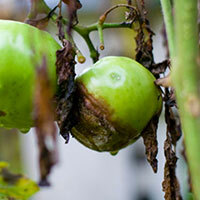 Garden diseases are a fight most gardeners will have to learn to combat at one point or another. Diseases feed off the plants we work so hard to grow and many times they are caused by inadequate growing conditions such as overwatering, poor airflow, or inadequate drainage. Sometimes diseases can be beaten by correcting these imbalances, and other times a chemical treatment is required. 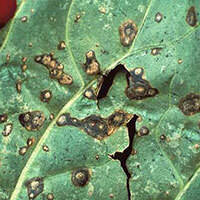 Alternaria Blight: Alternaria blight can be identified by black and brown spots forming on the leaves of the plant that eventually grow larger and form rings like a bullseye. The leaves of the infected plant will probably start to die. If the plant has grown fruit already, you may find sunken soft spots on the fruit. Preventing alternaria blight begins before planting by selecting the proper seeds. Using an organic seed treatment prior to planting can also help fend off garden diseases such as this one. If a plant becomes infected with alternaria blight, the best option is to dig it up and get rid of it before it infects nearby plants. Anthracnose: Anthracnose typically affects vegetables such as beans, melons, cucumbers, and tomatoes. 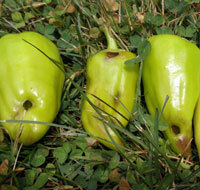 You can usually identify anthracnose by the small, sunken dark spots on the pods or fruit. A pinkish center may emerge in the center of the spots during continued wet weather. These types of vegetable garden diseases can be prevented and treated by spraying the infected plants with a lime and sulfur mixture. You should begin spraying the mixture as a preventative as soon as the leaves emerge during early spring time. Should a plant become too infected with anthracnose, you will need to dispose of it. Bacterial Leaf Spot: Bacterial leaf spot will form small dark spots on the leaves of the plants that will eventually dry up and fall out leaving holes in the leaves. 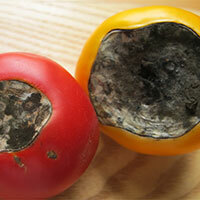 These same dark spots may also appear on the fruit. The vegetables that are most affected by bacterial leaf spot are peppers, tomatoes, and cabbage type crops. Unfortunately this is one of those vegetable garden diseases with no real cure. The best thing you can do to prevent bacterial leaf spot from spreading by using a copper based fungal spray on a weekly basis as soon as the first spots appear. You will also want to limit your use of nitrogen rich fertilizers, and practice crop rotation if you are able. Destroy any plants that become too infected with bacterial leaf spot. Club Root: Club root primarily goes after cabbage type plants. When infected, the leaves of the plant will wilt when exposed to the midday heat. The leaves may also yellow and fall off. The roots of the plants will swell and become distorted. The best defense against club root is to practice crop rotation and choose varieties that are known to be resistant to vegetable diseases. 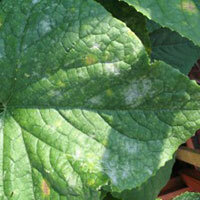 Downy Mildew: Downy mildew can infect numerous types of vegetables across your garden. You can identify it by the whitish purple growth that forms underneath leaves and along the stems of the plant. Downy mildew is most of caused by excessive moisture. Pruning your plants will help to improve the air circulation around them. You can also change your watering schedule to the morning, so that the plants have ample time to dry out throughout the day. If downy mildew is caught early you can treat it with copper based fungal sprays on a weekly basis until you've harvested your plants. If the plants are heavily infected with downy mildew, they will need to be disposed of. Late Blight: Late blight is a fungus that, as its name suggests, forms late in the growing seasons, sometimes well after the plant has blossomed. These types of vegetable garden diseases form as water spots on the leaves, with a white growth that forms on the underside of the leaves. Late blight most commonly affects tomato plants and potatoes. The best defense is to choose disease resistant varieties. Infected plants will most likely rot in wet conditions and die off. In some cases copper fungal sprays might help but most often plants infected with late blight will need to be disposed of. Mosaic Virus: Another one of those vegetable diseases that affects a wide range of plants. Mosaic virus will cause leaves to turn yellow or mottled green with veins. The leaves may begin to wrinkle or curl and the overall growth of the plant may become stunted. Mosaic virus is spread by insects such as aphids so if infected, you can begin by using pest control sprays to prevent the mosaic virus from jumping to other plants in your garden. Infected plants will ultimately need to be destroyed. Powdery Mildew: Plants and vegetables infected with powdery mildew start to develop a whitish powdery substance on the leaves. Plants that are heavily infected will have their leaves brown and fall off. This is another one of those vegetable garden diseases that affects a broad range of plants. Poor air circulation is a major cause of powdery mildew. You can treat with a baking soda mixture with a ratio of 2 tsp baking soda per gallon of water. Sulfur based fungal sprays are also effective against powdery mildew. Plants that severely infected must be destroyed. Rusts: Rusts are generally found on plants that have already matured, and can infect most vegetables. Plants will start to show rust colored spots on their leaves if infected. The primary cause of rusts is poor air circulation. Rusts can be treated by dusting infected plants with sulfur or sulfur based fungicides. Wilt: Wilt cannot be controlled by crop rotation because it can affect a great many different vegetables. You can spot wilt easily when the plants turn yellow or the leaves begin to look weak and flaccid. The best way to prevent wilt is to grow disease resistant crops, and learn to solarize your soil prior to starting your garden. Solarization is a great defense against many vegetable garden diseases.